PlayStation Plus February 2018 Games Announced | Nerd Much? Sony had officially announced what games will be free for PlayStation Plus members come February 6, including titles for the PS4, PS3, and PS Vita. The two headliners this time around are RiME and Knack. RiME is a game full of breathtaking beaches that are almost as relaxing as Journey‘s slide through sandy dunes. The gameplay is mostly simple puzzles and solving the mystery of the island your character has landed on. The game focuses mainly on the scenery and the small mysteries the puzzles reveal. As an indie game, and distinctly free for PS Plus members, it is worth a try. RiME is sweet and a relaxing time for anyone. Knack is a little more action-packed. A war broke out between the Goblins and the humans. Knack is the product of a science experiment, a special robotic technology that can use sun crystals for special attacks. 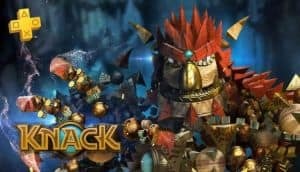 Knack is not all about collecting knickknacks either, there are plenty of politics and betrayals to uncover as you play through the game. Other games included in February are Spelunker HD (PS3), Mugen Souls Z (PS3), Exiles End (PS Vita), and Grand Kingdom (PS Vita, PS4). Spelunker HD is a critically acclaimed platformer with over 100 stages. It is also a great co-op game with up to four players for added chaos. Collect, climb, and dig your way through the caves of Spelunker HD. Mugen Souls Z is the sequel to Mugen Souls, an anime RPG that follows Chou-Chou and friends through another adventure. Just as before, it is up to Chou-Chou to save the day from an “ancient threat to her world” with the help of her goddess Syrma. It is still mildly surprising that Sony still offers free games on the PS Vita, but at least Exiles End is plaformer suited to the mobile system. Exiles End is distinctly now a Metriodvania game, as stated by the developers but inspired by old Commodore 64 action-adventure games. What do you think of Sony’s selection for February? Which games would you be interested in playing? Let us know in the comments below.